Elise Zhang is both adorable and terrifying, much like Mei, the character whose voice she performs in the English version of Overwatch — she voices both Symmetra and Mei in the Mandarin version. Today is the first day of the real-life Year of the Pig so she created a personal New Year’s greeting for Overwatch fans with the help of a few friends you might recognize. I’m not going to imply that the other Overwatch voice actors are just as lowkey intimidated by Mei as we are, but if Symmetra’s English voice actress Anjali Bhimani needs anything our DMs are open. While the voice actors — and writer Michael Chu — all cross paths occasionally at conventions, it looks like a few of the voice actors sent in their lines for this special video. It makes sense that Widowmaker’s actress Chloe Hollings, who Carolina Ravassa tracked down in Paris just like Sombra, would have to literally phone in her greeting, but this adds an extra degree of difficulty! Elise was able to coach Paul Nakauchi who plays Hanzo through his read, but Chloe did hers without a net. It’s also especially fitting that Josh Petersdorf leads off the festivities, as the voice of Roadhog. Elise finishes off the video with a greeting of her own, receiving a traditional envelope decorated in red and gold for her efforts. 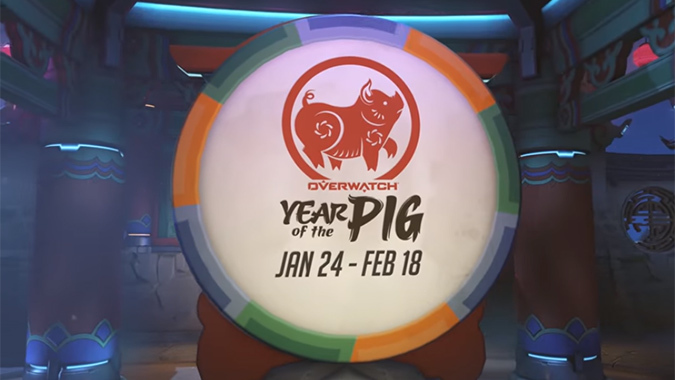 The Year of the Pig event will continue in Overwatch until February 18th, where you can get a whole bunch of Lunar New Year goodies of your own. Happy Year of the Pig from the Overwatch cast!